If you love coconut as much as I do you will want to make these delicious bars. A perfect dessert to serve family or company. We have coconut lovers in our family so this will disappear fast. In a medium sized bowl whisk together flour and icing sugar. Using a pastry blender cut in the butter until you have coarse crumbs. Press into a 9" x 9" square pan. Bake in a 350º oven for 20 minutes until slightly golden in color. Place on cooling rack and allow to cool while making the filling. In a medium sized bowl whisk together sugar, cornstarch, and salt. Add coconut milk, eggs and whisk until well blended. Remove from heat and add flaked coconut and extracts. Pour over crust. Allow to cool to lukewarm, then place in refrigerator and chill for a couple of hours until firm. What is icing sugar? Powdered sugar? Unsure on this but this sounds so fantastic!! Thanks for the great recipe!! Yes icing sugar is powdered sugar. Thank you! Was pretty certain it was. Yum! 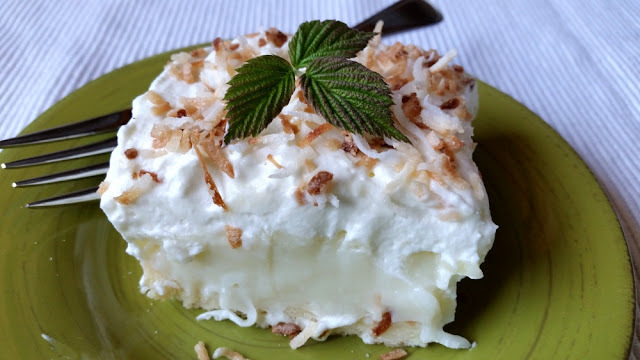 I had a slice of this delicious dessert, it is packed full of coconut goodness. Thanks Mom! This looks sooo delicious! I really need to make these asap. One question about cutting in the butter. Should the butter be chilled? Thank you! My butter was still slightly chilled. I took it out of the fridge when I started to put the recipe together. Is this something that could be prepared the night ahead, then kept refrigerated? Or would it get soggy? The crust would soften up a bit but I think it would be fine to prepare the night before. Thanks for your quick response! I'll give it a try! Yum - we love coconut over here too. Am saving this recipe! Used the microwave to cook the filling rather than the stove top and it turned out great! The entire family loved it!! Will definitely make it again. Most of the time I cook my puddings in the microwave as well. It is a time saver for sure. Thank you for letting us know you tried it and I'm happy it turned out great for you.